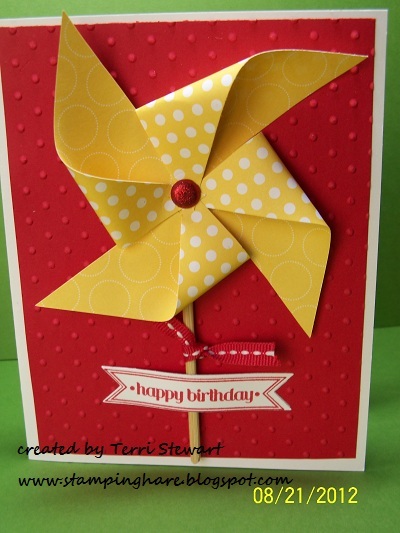 It's Terri with another stamping project. My version was inspired by a similar card made by Justin over at www.jkcards.wordpress.com. I made the card below (with the yellow background), and loved it so much I used it as one of my Stampin Up convention swap cards back in July. And it was posted here on July 24 with instructions on how to make it. But then I started making video tutorials and decided this card was so super awesome I had to make a video tutorial for it. I changed the colors for the video making the pinwheel in Daffodil Delight yellow and the background Real Red. But the camera didn't pick up these vibrant colors, so I 'm a little sad....but happy about the video! 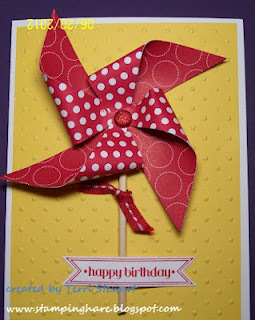 What do you think of my pinwheel card and the new video tutorial? Check out my blog to see more stamping projects.